A few months back at a Girl Power Hour (@GirlPowerHour) event, I met an events manager for Il Fornaio in Seattle. She emailed me, explaining that they do monthly tastings at the restaurant on the first Thursday of every month, and would love to have me attend. I was thrilled for this invite, but ended up busy every Thursday from February to April! The May tasting rolled around and I was finally able to make it to the restaurant to try out their regional tasting. The restaurant features a different region of Italy each month and for the first few weeks of the month, features a special menu with dishes showcasing that region. May 3rd to 16th featured the Campania region of Italy. This region is the best known of Italy’s Southern Regions and happens to be the birthplace of pizza and fresh mozzarella. Il Fornaio’s chef, Franz, has been with the company since 1996 and called Campania one of his favorite Italian regions. Before each course of our tasting, he explained the ingredients and how they are special to that region. The restaurant’s wine director also explained each wine of our courses and how they paired with the dish. It was my first experience at Il Fornaio and it will definitely not be my last! It was such a wonderful tasting. We each received a packet of pizza dough to make at home, along with a recipe for a margarita pizza (one of my favorites!). We started out the tasting with the Menesta Schitana, a cannellini bean soup; and the Pummarole e Capri, a tomato, mozzarella and basil dish. The mozzarella used in the dish is buffalo mozzarella, and was quite delicious! The dishes were paired with the 2008 Falanghina Sannio, Feudi di San Gregorio white wine. 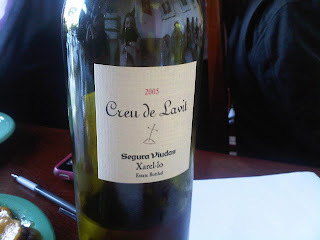 This was a very fruity wine, with very prominent flavors (pear stood out the most for me). This is a great “summer wine” and paired well with the starters. Our next tasting from the menu consisted of two pasta dishes. We tried the Strangulaprievete e Surriento, which was a potato gnocchi with fresh mozzarella, Parmesan, oregano, basil and tomato sauce. On this tasting plate we also tried the Risotto e Amalfi, a carnaroli rice with shrimp, mussels, clams, roasted red and yellow bell peppers, garlic and brandy. These were paired with a 2008 Greco di Tufo, Loggia della Serra, Terredora, a medium bodied white wine. In my opinion, this wine was much better paired with food than standing alone. It paired very well with the risotto and the apple flavors stood out the most. This tasting course was by far my favorite of the entire evening. I want to go back in there for a large size portion of the potato gnocchi, it was wonderful! From there we moved onto a tasting of Scaluppine a Caprese, a thinly sliced veal with tomato fillets and fresh mozzarella, as well as Spigula Dinto o Cuoppo, a bluenose sea bass baked in parchment paper with shrimp, mussels, claims, cerry tomatoes and white wine. These tastings were served along with a 2007 Rubrato Irpinia Aglianico Feudi di San Gregorio red wine. This was a very aromatic and full-bodied red with flavors of black cherry and spice that stood out for me. This wine is known to age well and the varietal is one of the world’s darkest colored wines. It had a smooth finish and was a great complement to the “surf and turf” of the veal and sea bass. We finished our tasting with a Delizia a Limone, a traditional lemon sponge cake filled with lemon pasty cream. This was soaked with limoncello. 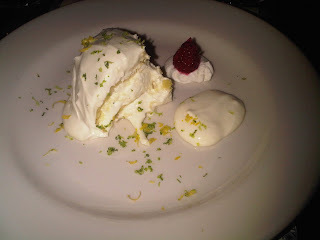 This delicate dessert was light and fluffy and very enjoyable. It was a perfect end to a very flavorful tasting of dishes. My food throughout the tasting was so good, I forgot to take photos until we reached dessert. Oops.. You’ll have to head in to the restaurant to try for yourself! I am so thankful for the opportunity to try out Il Fornaio, I will be back soon! 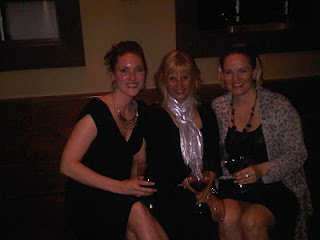 I’m so excited to be able to post about the second winemaker dinner I was able to attend. 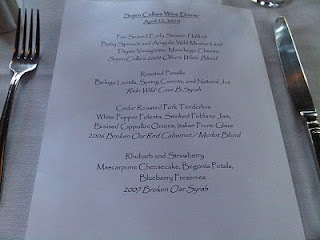 On April 22nd, 2010, Russell’s Dining & Bar in Bothell (@RussellsDining) hosted Sojen Cellars (@sojencellars, @sojengirl) for a winemaker dinner at the restaurant. After my first experience at the Andrew Will dinner, I was very excited to try wine and food pairings from a winery that I already knew quite well at a restaurant that I consider one of my favorites. Once again, neither winery nor restaurant disappointed. 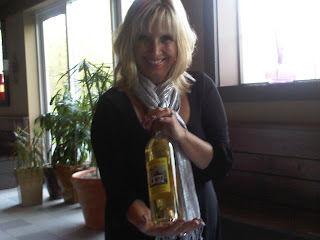 Sojen Cellars is owned and operated by Max & Jen Jensen and has a tasting room located in Everett, WA. The winery is a side project and passion for Max & Jen, as they both have jobs outside of the winery. While I haven’t had a chance to make it to the tasting room in Everett yet, I hear they have some great Friday night events with live music and tastings. I look forward to heading up there one of these days! Our first course of the dinner was pan seared early season halibut served with baby spinach and arugula, wild mustard and thyme vinaigrette and manchego cheese. This amazing course was paired with Sojen’s 2008 Olive’s White Blend. This wine was actually named after a dog, a small pug named Olive! 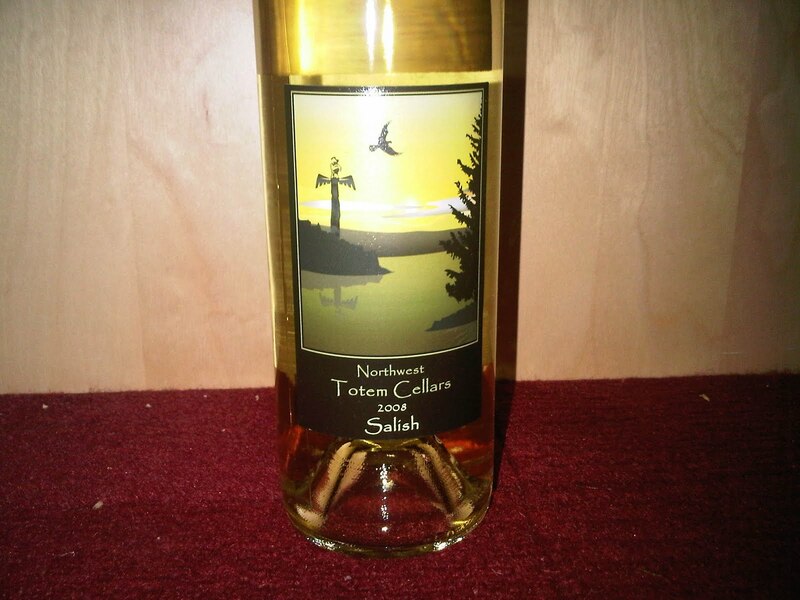 This white blend was an amazing pair for the flavorful halibut and a great way to begin the meal. A crisp white is so perfect with tender halibut. I tore through my plate so fast that I didn’t even get a shot of the course before hand. 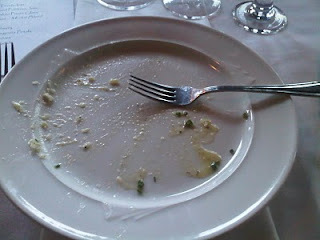 See photo below, it was just THAT good. 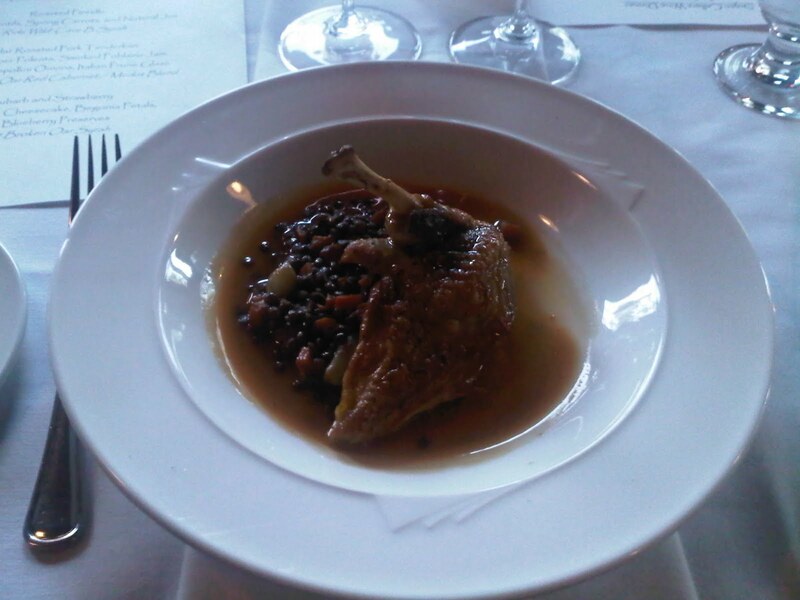 Next we moved on to a roasted pintelle with beluga lentils, spring carrots and natural jus. 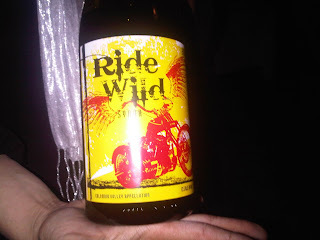 This course was served with Sojen’s ‘Ride Wild’ Cave B Syrah. This 100% Syrah was named for Sojen’s neighbor, a motorcycle shop! The label is great and lively and the same can be said about the wine. This is a very jammy, fruit forward Syrah and as Jen Jensen stated “it’s a California wine from Washington”. 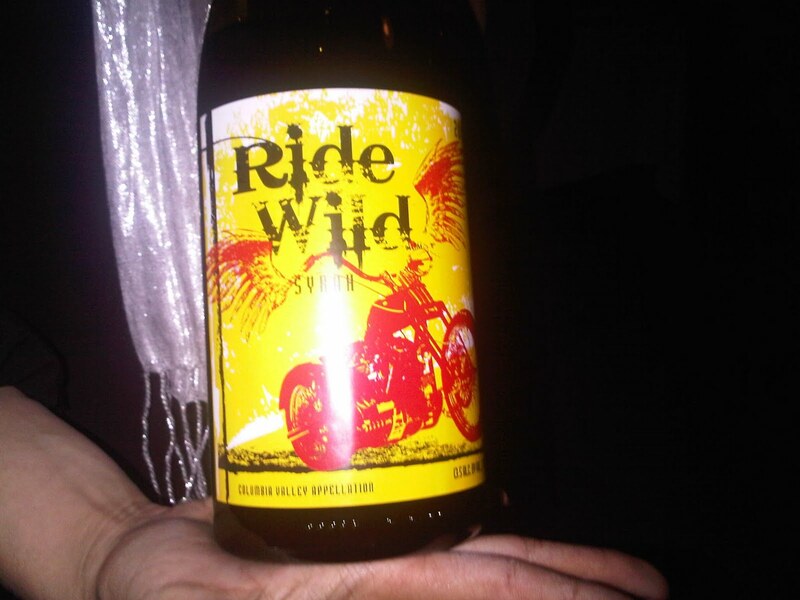 This wine ended up being my favorite, and I definitely purchased a bottle to go home with me. Pintelle is something I have never had before and what a treat that was. The combination of the pintelle and the lentils was fantastic. Our third course was a cedar roasted pork tenderloin with white pepper polenta, smoked poblano jam, braised cipollini onions, and Italian prune glaze. 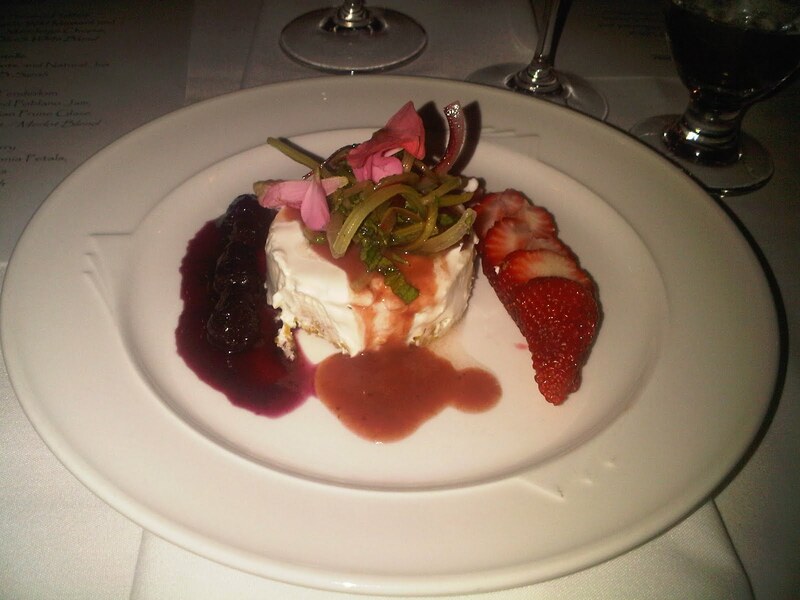 This amazing dish was served with the Sojen Cellars 2006 Broken Oar Red Cabernet/Merlot blend. This wine was originally made for local Wine Styles stores and is a 40% Merlot and 60% Cab. This was a deep and sassy wine and was quite enjoyable. 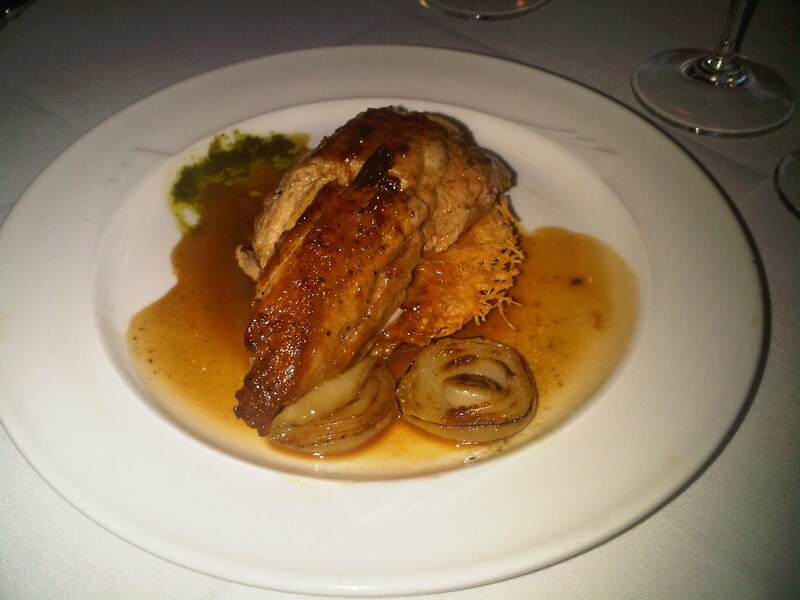 The pork tenderloin served in this course was by far the best I have ever had. Normally (at least for me) when you taste a pork tenderloin, it’s fairly dry and you usually dip in juice or sauce for additional flavor. Not this dish. The pork was cooked perfectly and the flavors at the first bite were so amazing that no additional sauce was necessary. I can’t say that I am usually “wowed” by pork dishes, but I most definitely was at this meal. We finished up our meal with a rhubarb and strawberry marscarpone cheesecake with begonia petals (edible flowers, who knew?!) and blueberry preserves. This delicious dessert was served along with the Sojen 2007 Broken Oar Syrah. This wine hits the pallet hard at first, but finishes smooth. It was a great complement to the sweet flavors in the dessert. While I’m not normally a cheesecake fan, this dessert was different than the norm, and was such a wonderful way to end our meal. Back on April 15th, everyone's favorite day of the year, a local restaurant and some writers put together a great tweet up to celebrate "Tax Day" with some great food and wine. The event was hosted by @BlackPearlSEA, @NorthESea, and @Seattle_Events and was held at Black Pearl Restaurant's Wedgewood location in North Seattle. We had a great little group in attendance to try out a variety of dishes from Black Pearl as well as a number of different wines donated for the event by @NWTotemCellars and @grlakewine. There were some faces I knew already, including @jenkmiller, @colbyjn, @BlackPearlSEA and @chrispirillo as well many new people I had never met before: @NorthESea, @Seattle_Events, @posiegirl, @hnlmark, @bananablossom, @danaek, @belvoir, @mypartini, and @chefamadeus. 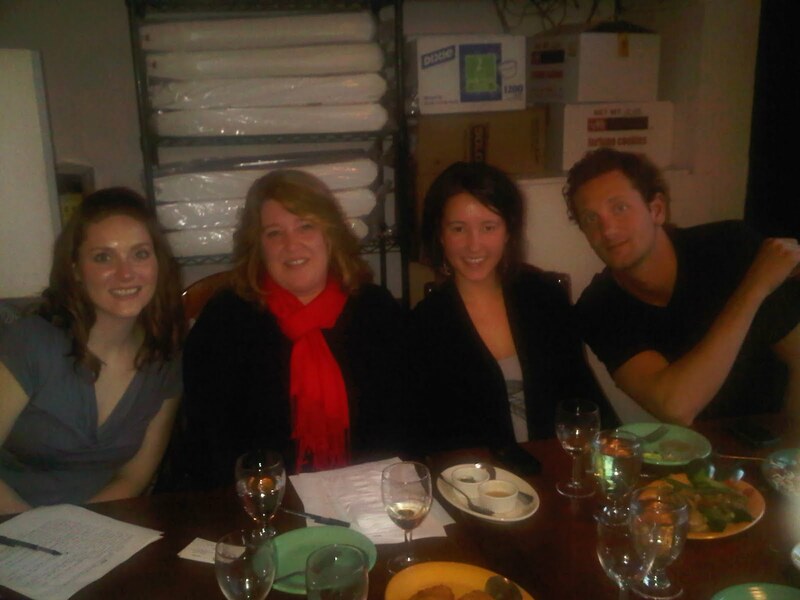 It was great to meet so many new people and share thoughts on the amazing food and wines we were able to try. The amazing Annie @BlackPearlSEA worked with @yasharseattle to pair the wine and food dishes for the event. The menu started out with a spicy sesame chicken paired with a Spanish Xarelo donated by @grlakewine. This was very fresh chicken in an amazing sauce. This paired nicely with this very refreshing white, one I love to call a "sunshine wine". Next we moved on to a spicy fish in szechuan sauce, which we tasted along with a Randall Harris Sauvignon Blanc, which was also donated by @grlakewine. This was a very tender fish with a very spicy flavor with the aftertaste. The very fruity and flowery Sauv Blanc was a refreshing and perfect pair for this spicy dish. This was a big favorite of many in attendance! Next we tried a salt and pepper crispy fried calamari paired with the @NWTotemCellars Salish. This 60% riesling and 40% viognier was a nice sweet wine that complimented this lightly breaded, but spicy, calamari. We then moved on to beef chow mein with homemade noodles, which was paired with the @NWTotemCellars Potlatch, a 52% Syrah, 47% Tempranillo and 1% Petit Verdot. This was by far my favorite dish of the entire evening. Just saying "homemade noodles" does not do this dish justice. The noodles are made in-house daily and are thicker, bigger and better than any chow mein noodles I have ever had. I could just eat an entire bowl of these on their own and be completely satisfied. This is a must try when dining at @BlackPearlSEA. The flavors of the paired wine really stood out and this was a great blend. Next up were pot sticker dumplings in both pork and vegetarian flavors. This was served along with a Randall Harris Syrah, donated by @grlakewine. The pork dumpling was my favorite of the two flavors, and was even better with some soy sauce. The Randall Harris was a very flavorful Syrah that was very tasty along with the pork flavors. We moved on to a mongolian beef, paired with the @NWTotemCellars Syrah. The mongolian beef was very spicy and very tasty and I was amazed at how well the Syrah tempered the spicy nature of the beef. I had never thought about wine pairings with spicy food before, but this was definitely one I will be trying again. I was happy to get to take home a bit of leftovers of the beef, it was fantastic! 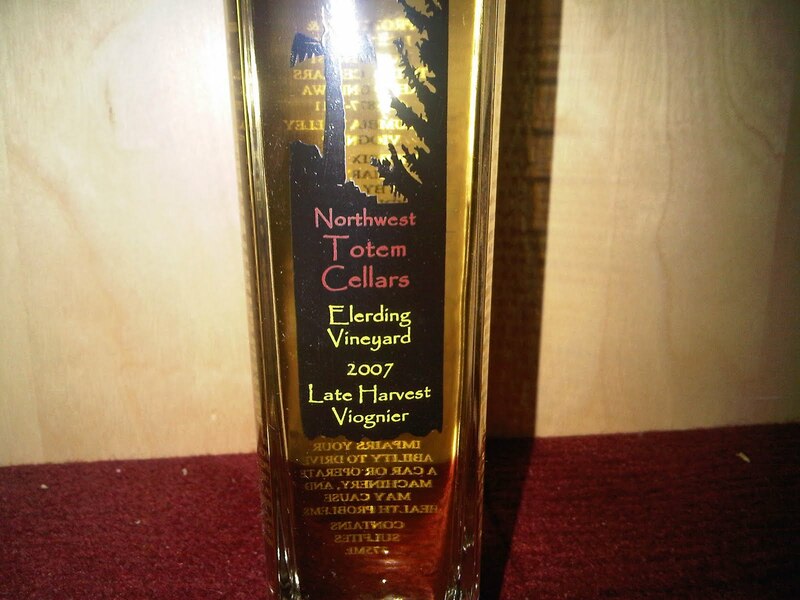 Last, but certainly not least, we tasted some shrimp cakes along with the @NWTotemCellars Late Harvest Viognier. The shrimp cakes had a wonderful sweet plum sauce accompanying them, which was terrific along with the sweet Late Harvest Viognier. As @chrispirillo commented on the wine: "this tastes like skittles!". 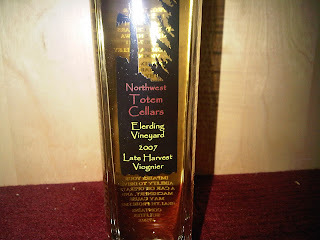 It was a very pleasant dessert wine that I look forward to trying again! Overall, my first visit to Black Pearl Restaurant was amazing and I look forward to dining there again. I couldn't believe the extent of dishes we were able to try, and we barely even grazed the surface of all they have to offer on their menu. I was excited to see that they offer delivery, but disappointed when I realized I live outside their delivery area! I'll just have to make the drive! It was great to try some new types of food and wine pairings, and it gave me some great ideas for the future. Thanks to all who organized this great "Tax Day" event.